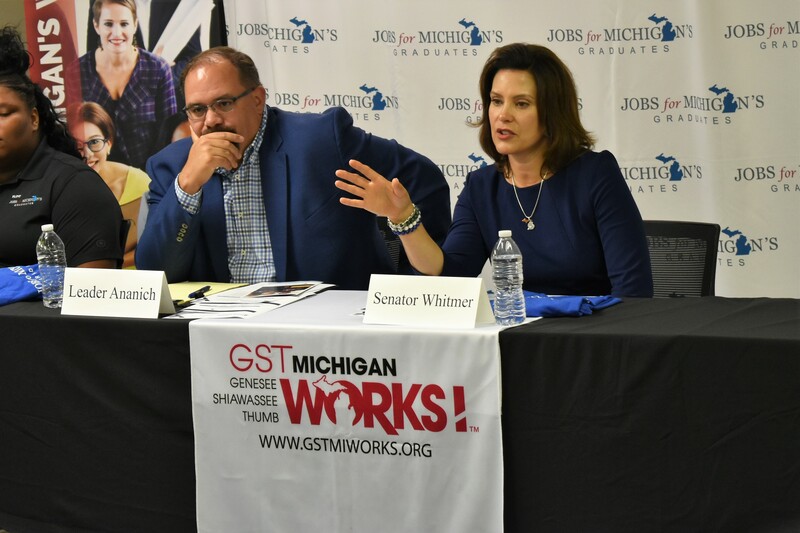 FLINT, MI – Listening to the results of Flint students enrolled in the Jobs for Michigan’s Graduates program, Democratic gubernatorial candidate Gretchen Whitmer said at a roundtable discussion Thursday that similar programs need to be expanded throughout the state. The program, offered by Mott Community College in partnership with Jobs for America’s Graduates and Michigan Works, helps students at risk of dropping out or who have already dropped out develop life skills and connects them with prospective employers and educational institutions. One program specialist at Flint’s Northwestern High School, Mary Ann Kost, spoke to Whitmer and Senate Minority Leader Jim Ananich during the event. Over two years working with the program, Kost was able to assist students in receiving $200,000 in scholarships and raised over $3,000 in grant funding for the program. “The passion about the work that you do is just awesome,” Whitmer said to Kost. Following the roundtable discussion, Whitmer held a labor rally with Congressman Dan Kildee (D, MI-05) and Teamsters President James P. Hoffa. Polling conducted Jul. 21 and Jul. 22 by EPIC-MRA shows Whitmer maintaining her lead in the primary with 42% support, followed by entrepreneur Shri Thanedar at 19% and former director of the Detroit Health Department Abdul El-Sayed at 15%. Voters were surveyed before the effect of U.S. Senator Bernie Sanders endorsing El-Sayed and U.S. Senator Kirsten Gillibrand endorsing Whitmer could be measured. One of four Republican candidates for governor will face the Democratic nominee in the general election. Polling conducted by EPIC-MRA concurrently to the Democratic primary survey shows Attorney General Bill Schuette in the lead with 33% of surveyed voters supporting his campaign, followed by Lieutenant Governor Brian Calley at 18%, state Senator Patrick Colbeck at 10%, and Dr. Jim Hines at 6%. Whitmer is the front-runner in a hypothetical general election matchup with Schuette, according to polling from Emerson College, which shows the race at 43% to 36%. Michigan will hold its primary election Aug. 7, followed by the general election on Nov. 6.